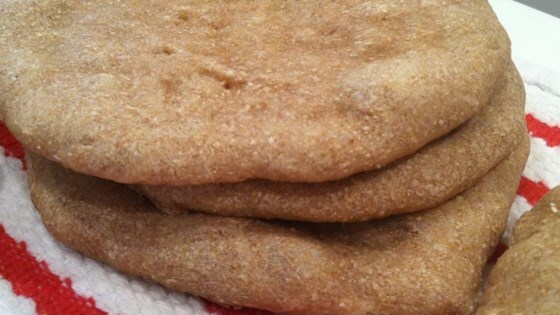 "I came up with this recipe after a search for a whole wheat pita bread left me frustrated. I used soy flour to totally eliminate white flour. What resulted was a hearty pita with a nice nutty flavor. It tastes great with sandwich fillings, peanut butter, or dipped in hummus. This is my first recipe, so I hope you enjoy it." In a bowl mix the water, yeast, molasses, and salt. Let sit 5 to 10 minutes, then gradually mix in the whole wheat flour and soy flour. Turn out onto a floured surface, and knead until smooth. Place in a large bowl lightly coated with cooking spray. Cover with a towel, and let rise in a warm place for 1 hour. Punch down the dough, and knead for 5 to 10 minutes. Divide into 6 pieces. On a lightly floured surface, flatten each piece to about 1/8 inch thick with a rolling pin. Cover with a towel, and let rise 30 minutes. Preheat oven to 450 degrees F (230 degrees C). Warm a baking sheet in the preheating oven for about 2 minutes, then remove from heat and sprinkle with cornmeal. Arrange the dough rounds on the prepared baking sheet, and bake 6 minutes in the preheated oven. Remove from heat and cover the bread with a moist towel to soften. When cooled, slice in half and use a knife to cut pockets in the bread. Make this whole wheat bread, which is delicious and easy.